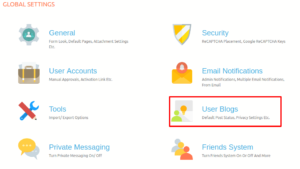 Enable Blog: This option turns on the social blogging for the users/members being added to Groups. Make sure you have a page with User Blog short code for users to submit posts. Default Blog post Status: Here you can specify the default status of the blog once it has been submitted. It can be: pending, published, or draft. Published allows it to be automatically approved and Pending requires admin moderation. Feature Image: This option allows users to add featured image to their post. A featured image is displayed prominently above the blog post. Tags: It allows for having the posts tagged with required keywords. Helpful for better blog search capabilities. Use Tinymce Editor: Enables WordPress’ rich text editor for post formatting. If requirement is to allow users to submit only text data, this option should be kept “off”. 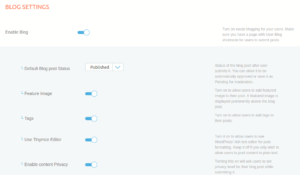 Enable content Privacy: Turning this “on” will ask users to set privacy level for their blog post while submitting it.